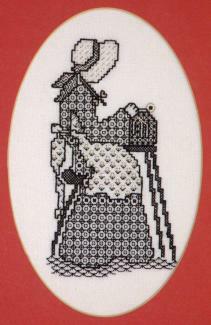 Some designs work in both blackwork and cross stitch. 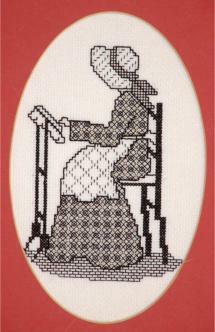 The cross stitch lacemaker was originally designed for the National Christmas Lacemakers Fair, held in Birmingham each year. She proved so popular, selling out on the first day, that I was soon asked to create a blackwork version of the same design. Later, a partner, the blackwork stitcher, was added to the range. If you haven't tried blackwork before you might find my beginners blackwork e-book helpful to teach you the basics. Simple and quick to stitch the blackwork lacemaker is ideal if you enjoy both crafts. Or stitch her for a lacemaking friend, in black with a touch of gold metallic in her hat and dress. I have also seen her stitched on the front of a sweatshirt! Facing the opposite direction to the lacemaker, this design makes an ideal partner. Different fill patterns are used for this design. 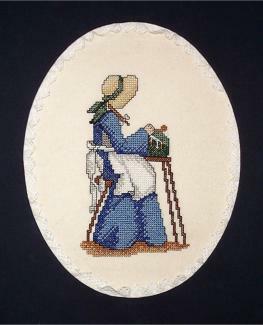 The original cross stitch lacemaker is still a best seller! Worked in whole crosses only (no fractional stitches) she is easy to stitch.